I still feel guilty. That’s the same way I felt after reviewing the last reduced guilt pasta I tried. While this is okay, there are better alternatives in the TJ freezer case. The sauce has a mild tomato flavor, but is otherwise bland. The shells are stuffed with 50/50 spinach/ricotta mixture . The mixture produces a nice flavor. The shells themselves feel mushy and overcooked. There’s a low sauce to shell ratio, meaning it would have been nicer to have some additional sauce. The sauce becomes rather thick because the sprinkled on cheese mixes in with the sauce. The cooking directions seem strange. 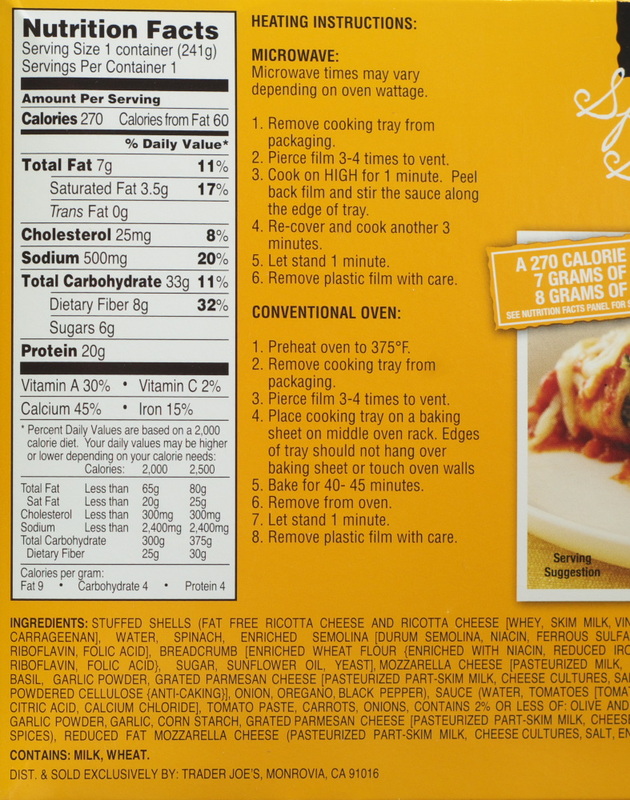 After a minute in the microwave you’re asked to remove the container and stir around the inside edges. In retrospect, I assume this was to prevent what happened. The sauce/cheese mixture in the corners overcooked bigly. This created some nicely burnt to really burnt bits of cheese and sauce in the corners. The nicely burnt pieces were enjoyable, depending on personal preference. The really burnt bits were not so enjoyable. One other item of note, a knife was needed to cut through the shells. Overall this has; a nice filling, badly cooked shells, not enough of a bland sauce and a sauce that mixes too readily with the cheese sprinkled on top. And, you’ll probably feel just as guilty after trying these. This entry was posted on 05/28/2018 at 12:13 and is filed under Recipes, food, cooking and related items, Trader Joe's. You can follow any responses to this entry through the RSS 2.0 feed. You can leave a response, or trackback from your own site. Definitely not one of the best out there I would say Steveo. Yes. Just taking a que from fearless leader? 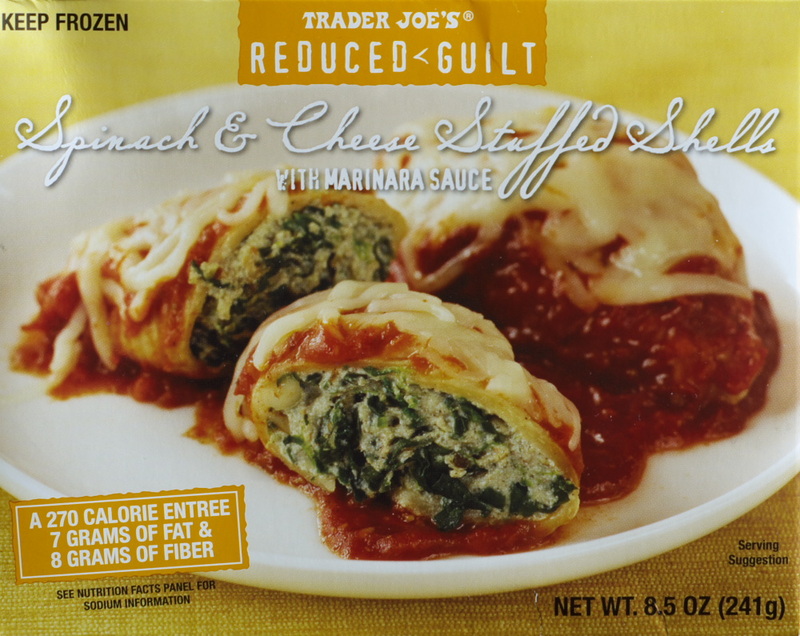 I felt guilty after eating these because I still needed to eat another meal after the 2 shells here.